More people are exploring the trek from Choquequirao to Machu Picchu because of the magnificent landscapes, hot springs and the close contact with the Andean communities. This trek includes visits to two very important Incan archaeological sites and is a Machu Picchu route that has fewer backpackers. We at Machu Picchu Trekking are specialists in Choquequriao Treks; it’s truly a spectacular hike that plunges down into the Apurimac canyon. It’s one of our favorites because of the landscape and remote nature. Note: This trek has steep ups and downs, with a change of altitude of over 1,600 m/5,200 ft. in one day. We strongly recommend at least two days of acclimatization in Cusco prior to trek departure. 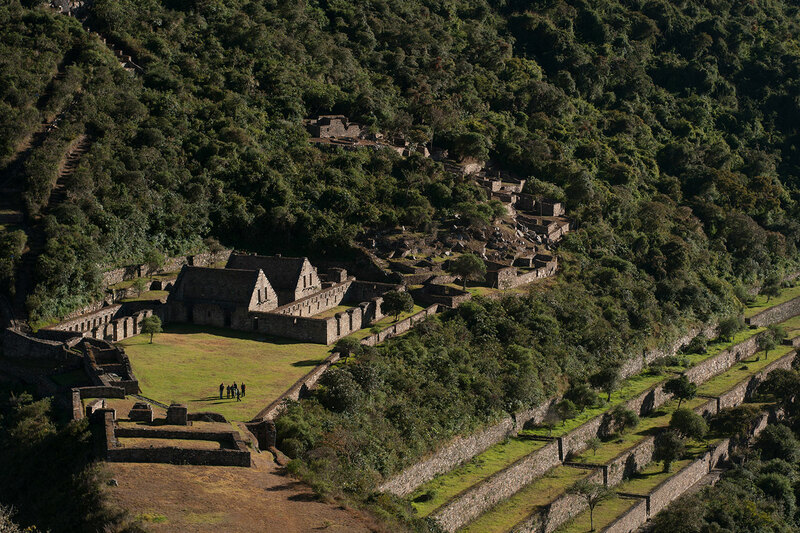 Inca Trail Availability: Space on the Inca Trail is subject to availability. For ecological and archeological preservation, Inca Trail permits are limited to 200 backpackers and 300 support personnel (guides, porters and cooks) per season. We recommend booking 6 – 12 months in advance of your desired travel. Permits for hiking Huaynapicchu and Machu Picchu mountain are separate from your Inca Trail permit. Both have limited availability and should be reserved at the time of your booking. 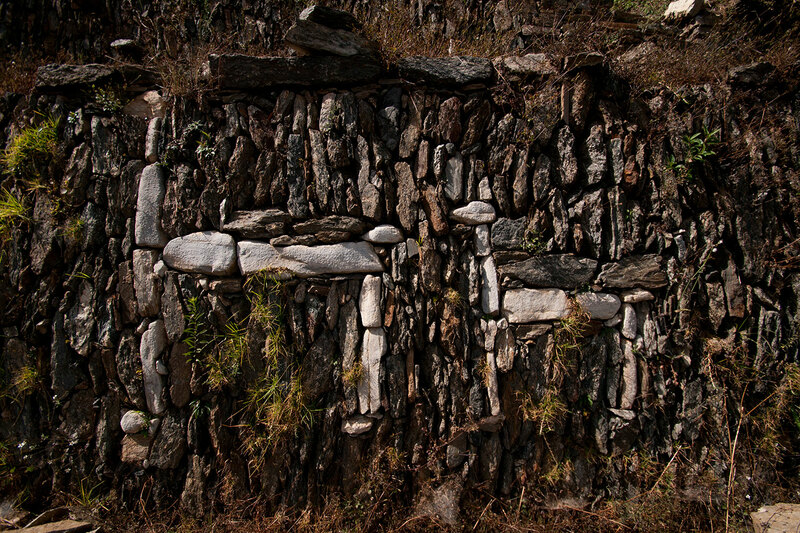 A systematic exploration in the archaeological site «Choquequirao», Cusco, Peru, has produced in the year 2004 the finding of a group of naturalists and geometric motifs that were drawn with stones on a sector of terraces in this important site; a settlement located next to the Apurimac river in the Amazonian rainforest – more accurately, the area is called ceja de selva, loosely translated to “the eyebrow of the jungle” to denote the transition from mountains to jungle. This finding opened the possibility of developing a comprehensive and controlled investigation in these archaeological materials, which were developed in the year 2005. Part of the carried out analyses included technical approaches from the artifact theory, and historical correlations. This paper expose the particular analysis of the naturalist motifs stressing the proposition of the artistic nature, and the cultural and chronological association of these motifs. Our adventure begins at 5:00 AM, leaving Cusco, we will drive for four hours towards the Andean community of Cachora. In Cachora we will meet our horsemen and pack all of our equipment onto the horses. We begin a fairly flat walk to La Colmena, where we hike uphill through the high pass of Capuliyoc . The pass will give us a great view of the Apurimac Canyon. We descend to Playa Rosalina (1,550 m/5,115 ft), where the day ends on the banks of the Apurimac River, a main tributary of the Amazon River and the Amazon rainforest. The morning begins early with a nice breakfast and we will start hiking uphill through a long and narrow trail. After breaking for lunch we hike to Choquequirao (3,103 m/10,178 ft), arriving around 4:00 PM. 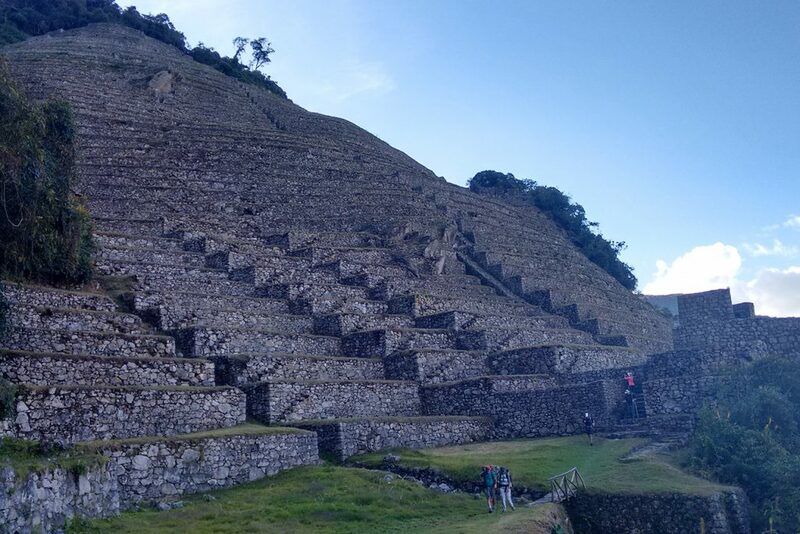 Here, we will enjoy some free time to explore the terraces and the Inca constructions. As the sun sets, there is a great opportunity to enjoy the magnificent view over the canyon, where condors often are spotted. We start the day ascending to 3,300 m/10,890 ft. Along the path, we will pass through the archeological site of Pinchi Unuyoj (2,750 m/9,075 ft); we have the opportunity to birdwatch, explore flora and fauna, including orchids and view local coca plantations. Afterwards we descend down the mountain at Rio Blanco (1,900 m/6,270 ft). We finish the day with another ascent to Maizal (3,000 m/9,900 ft) where we spend the night for a well deserved rest. Day 4 is a big hiking day, mostly hiking uphill. Along the way, we will view impressive Inca trails and Minas Victoria or Inca mines. 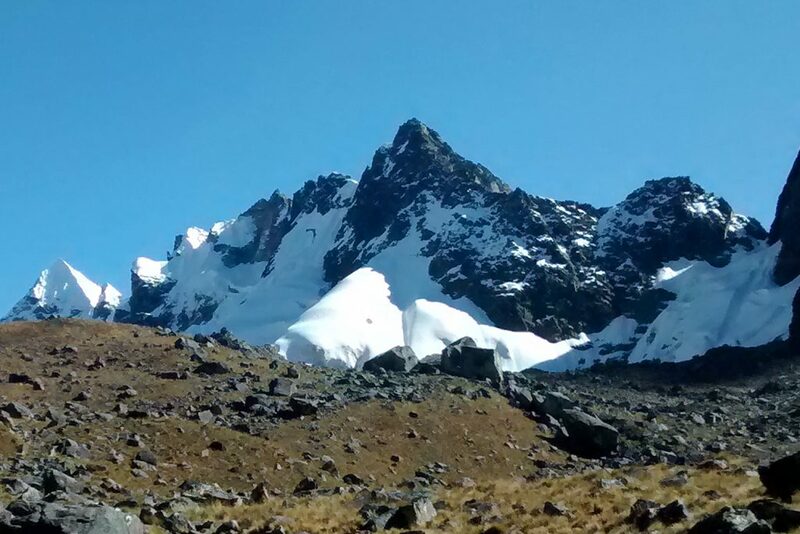 After we reach the highest peak of the day at 4,150 m/13,695 ft, we will descend to our campsite (3,800 m/12,540 ft). After an early breakfast, we will ascend to the highest pass in the trail at 4,670 m/15,410 ft. The view from there is amazing and we will be surrounded by snowcapped mountains such as Sacsarayoj Padreyoj. After peaking, we will descend to our campsite at Colpa Pampa (3,630 m/11,979 ft). After breakfast at 6:00 AM, we hike until we reach our lunch site at La Playa. After lunch we will have a fairly easy hike downhill, where you will be able to experience the jungle highland. 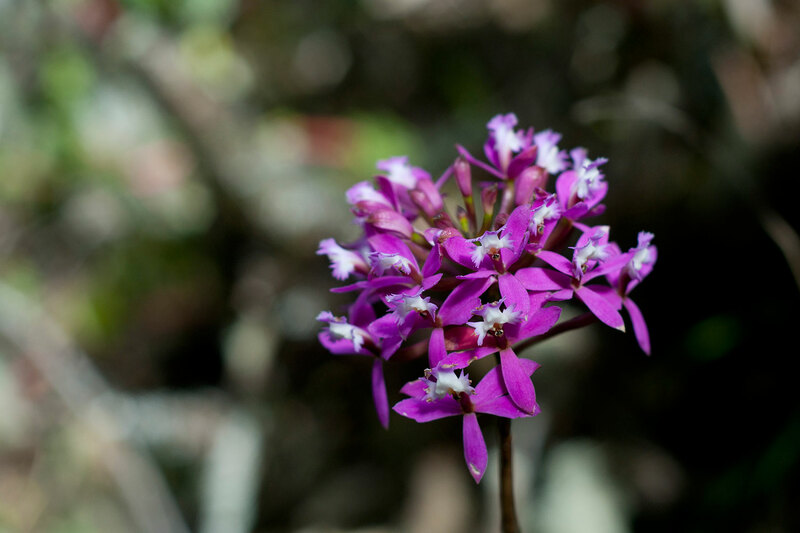 Here, you will see coca plants, coffee trees, fruit plantations, birds, orchids, and begonias; this is another great place to birdwatch and observe the biodiversity of Ceja de Selva. At this point our hiking is interrupted for a moment and we will be transported by bus for two hours down to the village of Santa Teresa, where a nice dinner awaits us. We spend the night in tents. In Santa Teresa you can visit the natural hot thermal springs for $4 USD. We have breakfast and after an hour-long bus ride, we walk for two hours to get to the Urubamba River and the hydroelectric station for lunch. We then continue on our three-hour walk towards the town of Aguas Calientes (Machupicchu pueblo). This walk goes along the river and is one of the most beautiful walks with a great opportunity to take some really nice photos. In Aguas Calientes we will check into our hostel, dine, and rest before the next day in Machu Picchu! NOTE: If you don’t want to walk after lunch, you can take a train from the hydroelectric station to Aguas Calientes (Machupicchu pueblo), but it leaves only in the late afternoons and can be a long wait. We will hike uphill for three hours until we reach 2,810 m/9,273 ft. After our ascent we will have an excellent view of the lost city of the Inca’s, Machu Picchu. Afterwars, we descent where we will walk along the Urubamba River to the hydroelectric station. From there we will walk or take the train to Aguas Calientes (Machupicchu pueblo) and spend the night in a hostel. After breakfast we will take the bus to archeological site of Machu Picchu. For those that have a reservation, you will hike Huaynapicchu (2,720 m/8,923 ft) or Machu Picchu Mountain. It takes 45 minutes to reach the top of Huaynapicchu and you can also go behind the mountain to experience the cave. Afterwards, your guide will take you on an approximately 2 hour walking tour of the citadel, showing you the most significant areas followed by free time to explore the UNESCO World Heritage Site at your own pace. In the afternoon, we will take the train from Aguas Calientes back to Cusco, arriving around 9:00 PM.